Almost all of the parts for this kit where made on a Makerbot 3-D printer! Michael Curry's Turtle Shell Racer - High Powered Edition Thingiverse blog post / instruction manual is now live! LInk to page! His turtle shell racers where the talk of Maker Faire Detroit! Link to the instruction pdf. 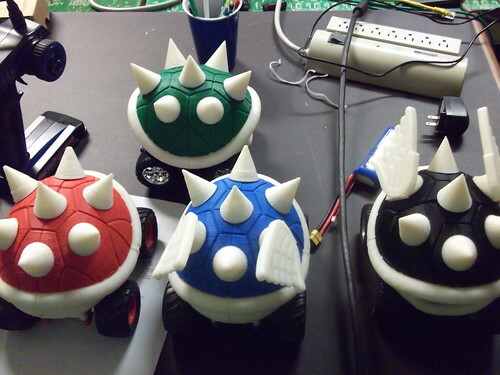 I must warn you that you need a 3-d printer or some other way to make the shells for the racers. The project is open sourced so I can not wait to see what mods people come up with. Check the post above it was links to the plans on Thingiverse! We wanna express you thanks friend its very constantly work by the good feelings.